The latest TicWatch is an improvement upon the last few affordable watches from the company. It doesn’t offer innovative new features like the TicWatch Pro, but the TicWatch C2 is a solid choice for anyone looking for a cheaper Wear OS watch. Mobvoi only started making smartwatches in the last couple of years, but it's a company that has performed well and has multiple products in our best smartwatch list due to what they offer at an affordable price. The TicWatch C2 is the latest addition to the growing range of TicWatch products and it's the first sequel to the TicWatch Classic, the company's first ever wrist companion. That means it sits slightly above the more affordable TicWatch options but isn't as high-end as the TicWatch Pro that came out in early 2018. Below you can read about our full experience with the TicWatch C2. You can buy the TicWatch C2 now in the US, UK and Australia, and you’ve been able to pre-order it since November 2018. It’s now on sale from the official Mobvoi website, and we expect to see it appear at third-party retailers soon. The price is set at $199.99 / £179.99 / AU$299, which means it's a touch more expensive than the TicWatch E and around the current selling price of the TicWatch S. That watch was more expensive at launch though. It's a bit cheaper than the top-end TicWatch Pro. That's $249.99 / £219.99 / AU$369.99, so the price difference isn't huge and if you're after the Pro's two-display screen tech it will be worth you spending that extra. That said, this watch is trying to be more affordable than the top-end device from Mobvoi so it’s worth a look if you’re on the hunt for an affordable watch. The TicWatch C2 feels more premium than the first generation of this line of watches, and it’s certainly more premium than the TicWatch E or S. All of that said, it doesn’t feel as high-end as the TicWatch Pro and it doesn’t have as many features either. There’s a 1.3-inch AMOLED display at the heart of the watch with a resolution of 360 x 360, which is what you’ll use to navigate around the UI. There are also two pronounced hardware buttons on the right hand edge of the watch to help you move around the interface. The top button has an odd indent that’s an orange color, but it gives it a unique look much like how the crown on the Apple Watch Series 3 and Apple Watch 4 has been a different color. 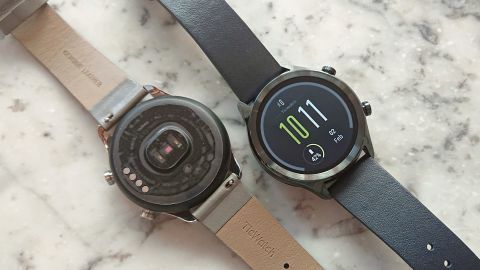 There’s no interesting second screen tech here like you’ll get on the TicWatch Pro, which is a bit of a shame, but it has allowed the company to make this watch both thinner and lighter. The watch itself is made of stainless steel and comes in silver, black or rose gold. The rose gold variant sports 18mm straps and is a touch thinner at 12.8mm, while the black and silver ones are 13.1mm thick and sport 20mm straps. It's actually just the front of the watch that is made of stainless steel. That ensures the most visible part looks premium, but it’s a little less good looking on the rear as that’s plastic. But if you want you’ll be able to keep that a hidden secret next to your wrist. You can get a variety of leather straps, but Mobvoi has confirmed that it will bring more options to market soon as well. It’s an odd choice from Mobvoi to initially alienate those who don’t want leather. For anyone who wants to avoid leather or to use this for exercise, you may want to buy a separate third-party silicone strap to put with this. Back to the thinness, the rose gold variant is particularly thin as there isn’t a lip over the top of the bezel around the display. You can see that clearly in the photo above, and it’s just one way the company has made this version more suitable for smaller wrists. All versions of the TicWatch C2 are also IP68 water and dust resistant. That means it will be able to survive a jog in the rain, but Mobvoi has confirmed this watch isn't designed for use in a pool, so you won't be able to track your swimming stats with this.